Sunday, July 14, 2019 1–4 p.m. This workshop will introduce the ecology of the humble bumblebee. 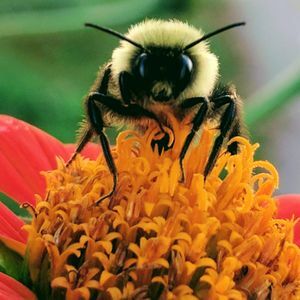 Join Melinda Fegler and Lindsay Hollister of Pollinators Prospering People (PX3), a nonprofit dedicated to promoting sustainable pollinator habitat, to learn about the bumble's importance for wildlife needs and in humans' edibles gardens. You'll also learn Maryland bumble ID and how to design a garden to attract bumblebees, and you'll build your own bumblebee hive box. This is the first in a series of three PX3 programs offered this month at the Arboretum. Solitary Bee Beginnings is July 21, and Caterpillars to Butterflies is July 28.